Peanuts! Hot Dogs! Baseball Books! Jennifer McGaha never expected to own a goat named Merle. Or to be setting Merle up on dates and naming his doeling Merlene. She didn't expect to be buying organic yogurt for her chickens. She never thought she would be pulling camouflage carpet off her ceiling or rescuing opossums from her barn and calling it "date night." Most importantly, Jennifer never thought she would only have $4.57 in her bank account. When Jennifer discovered that she and her husband owed back taxes—a lot of back taxes—her world changed. Now desperate to save money, they foreclosed on their beloved suburban home and moved their family to a one-hundred-year-old cabin in a North Carolina holler. Soon enough, Jennifer's life began to more closely resemble her Appalachian ancestors than her upper-middle-class upbringing. But what started as a last-ditch effort to settle debts became a journey that revealed both the joys and challenges of living close to the land. 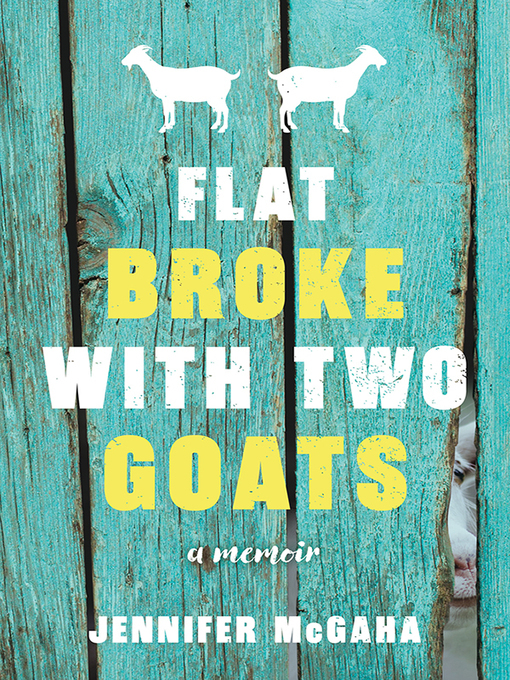 Told with bold wit, unflinching honesty, and a firm foot in the traditions of Appalachia, Flat Broke with Two Goats blends stories of homesteading with the journey of two people rediscovering the true meaning of home.